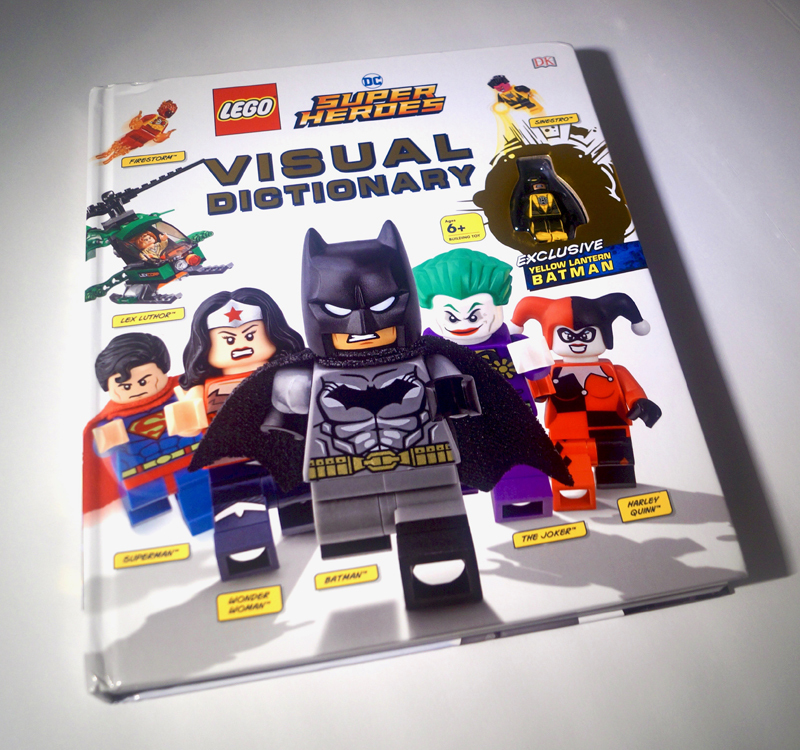 The LEGO DC Super Heroes Visual Dictionary is a nice-looking book that is a guide book to the DC Super Heroes theme. As such, it has a lot of detail on the visual side of things – there are photos where details are pointed out but things like complete set lists are not. The book is broken down into 4 chapters: Super Heroes, Super-Villains, The LEGO Batman Movie, and Behind the Scenes. The first three chapters use photography from LEGO, so it is dazzling. Overall art direction is clean, with ‘data boxes’ added with models giving set information. For me, it would have been nice to have a thumbnail photo of the set box with the separate models to key to the sets. If I am looking for a set, knowing what the box looks like would be really help me. What is helpful is that the book has an index to quickly find where things are in the book. And, since it’s a guide book of sorts, it covers most sets and minifigures. It doesn’t mention some minifigures – the San Diego Comic Con exclusives are represented only by Shazam and Arsenal, but they are not noted as such. Brickheadz are also not in this book. For the adult builder, the best section will the last one, with quick interviews with the design team to the DC Super Heroes theme. There are some photos of preliminary minifigures that are interesting to see and compare to the final results. Some of the information in the interviews is also fun to know. Finally, the LEGO DC Super Heroes Visual Dictionary has a exclusive minifigure – Yellow Lantern Batman. For those minifigure fans, this is a pretty good figure to get, as the printed details on the figure are pretty sharp, he has two expressions, and his back is printed. So, is the book worth the price? For the younger builders the want to know what does what on a set vehicle or who the Captain Boomerang minifigure is, this is a good index to get to know the theme. For them, it’s a great buy with a minifigure as a bonus! For the adult, it’s a tougher call unless the adult is a LEGO completist. The book isn’t as detailed as it could be, so its value as a reference is not ideal. However, the behind the scenes info and minifigure would make it appealing to them. ← Jump aboard the sleigh and head down to the snowy LEGO® Creator Expert 10263 Winter Village Fire Station!